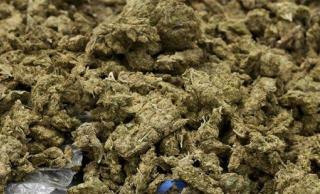 (Newser) – "The mice ate the marijuana" was an excuse no more believable than "the dog ate my homework" for authorities in Argentina, where eight police officers have been fired over the disappearance of around 1,200 pounds of pot. The officers in Pinar, roughly 40 miles west of Buenos Aires, argued that the missing drugs had been "eaten by mice" in the warehouse for impounded drugs, the Guardian reports. Some 13,220 pounds of marijuana had been registered there two years earlier and investigators found that the total was more than half a ton short. Forensic experts testified that it was very unlikely that even a large number of rodents could have consumed so much marijuana. So the cops wearing mickey hats as cover worked? Seems like the whole department is on the take. Why store drugs in the first place? Should be destroyed.